THE BENCHMARK private residential property price index rose 0.7 per cent in the third quarter of 2017 over the second quarter, slightly faster than the 0.5 per cent increase shown in the flash estimates, according to data released by Singapore’s Urban Redevelopment Authority (URA) on Friday. In Q2 this year, the index dipped 0.1 per cent quarter on quarter. The rise in the index for Q3 2017 comes after 15 consecutive quarterly declines since the peak in Q3 2013. URA said that prices of landed properties rose 1.2 per cent in Q3 2017 after dipping 0.3 per cent in Q2 2017. Prices of non-landed properties increased 0.6 per cent after dipping 0.1 per cent. Prices of non-landed properties in the prime areas or Core Central Region (CCR) rose 0.1 per cent compared with the 0.5 per cent drop in the previous quarter. Prices of non-landed properties in the city fringe or Rest of Central Region (RCR) climbed 0.5 per cent, following a 0.6 per cent increase in the previous quarter. Prices of non-landed properties in the suburbs or Outside Central Region (OCR) expanded 0.8 per cent, contrasting with a 0.3 per cent fall in the previous quarter. URA’s rental index for private homes remained unchanged, compared with a 0.2 per cent decline in the previous quarter. The vacancy rate of completed private homes (excluding executive condos or ECs) rose to 8.4 per cent as at end-Q3 2017 from 8.1 per cent as at end-Q2 2017. As at end-Q3 2017, there was a total supply of 35,022 uncompleted private residential units (excluding ECs) in the pipeline with planning approvals, lower than the 35,423 units at end-Q2 2017. Original article from Straits Times by Grace Leong published on 16th October 2017. 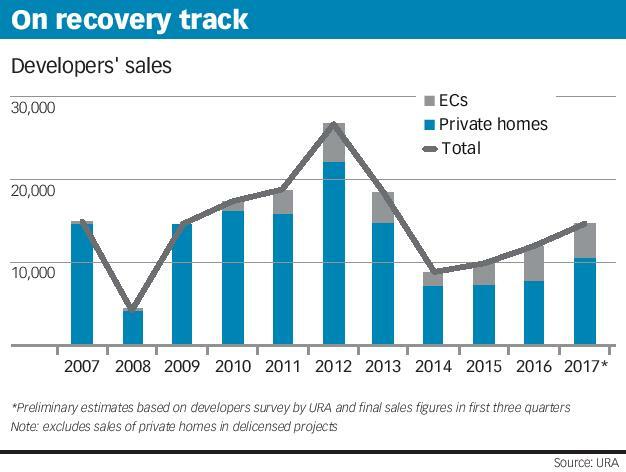 SINGAPORE – The number of new private homes sold in September rose 29 per cent from a year ago, according to Urban Redevelopment Authority (URA) data released on Monday (Oct 16). Developers sold 657 units last month, 148 units or 29 per cent more than 509 new private homes moved in September last year. New private home sales last month though were down 47 per cent from 1,246 units sold in August. Analysts attribute the slower sales to the Hungry Ghost Month effect, when sales typically drop off. But the takeup of new homes excluding ECs for the nine months of this year has been robust, jumping 62.9 per cent to 9,582 from 5,883 in the same period last year. 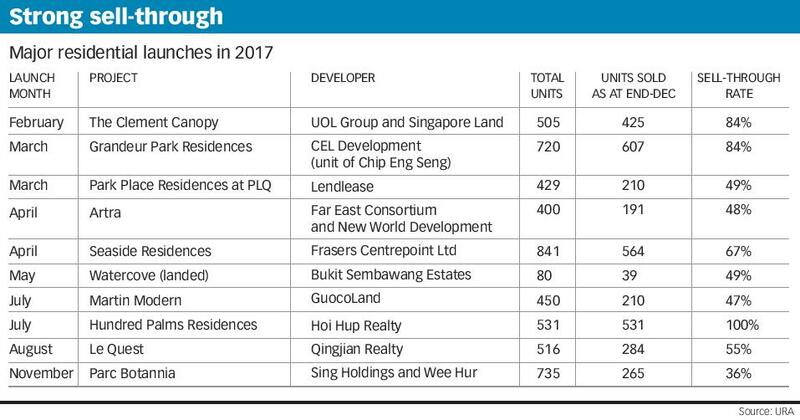 The top-selling private residential project last month was Chinese developer Kingsford’s Kingsford Waterbay in upper Serangoon, which sold 45 units at a median price of S$1,289 per sq ft. In the EC segment, Parc Life at Sembawang Crescent is the top selling project last month, which sold 48 units at a median price of S$795 per sq ft. Developers launched just 73 private homes – excluding executive condos (EC) – in September down 84.8 per cent from 479 homes launched a year ago. In the EC segment, 249 new units were transacted last month, when no new EC projects were launched. Combined, there were 906 private homes and ECs sold last month, 17.8 per cent lower compared with 1,581 in August. But year-on-year, total sales of new private homesand ECs were up 42.9 per cent from September last year.